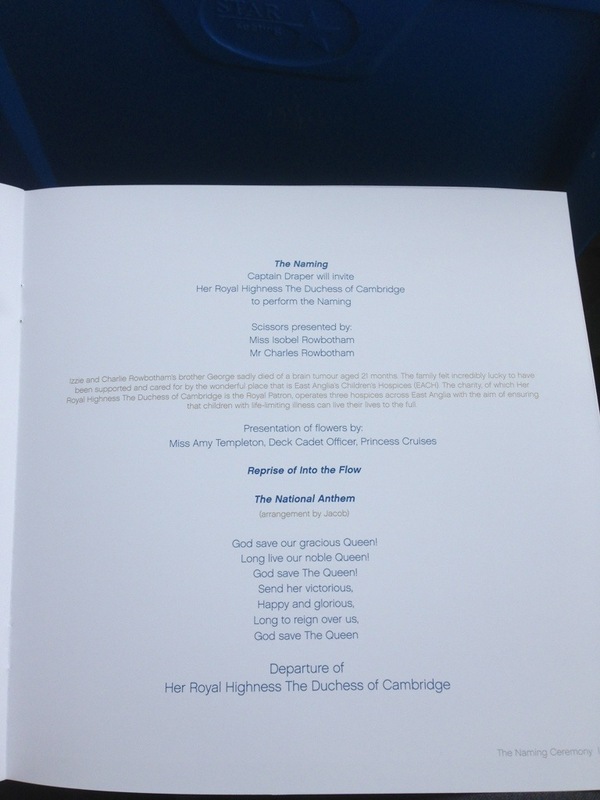 The excitement is building as the Royal Princess naming ceremony is about to start. It does feel a bit of a waste when Moët and Chandon is used on Royal princess’s hill. 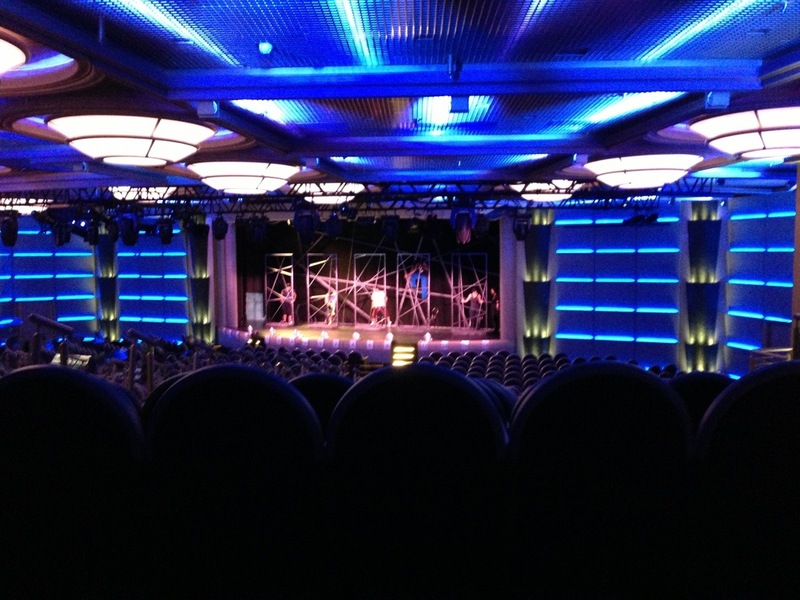 Below is a quick pic of the beautiful theatre with the dancers practising for a show. The theatre seats were very comfortable and all seats had a view with no pillars to spoil the fun. 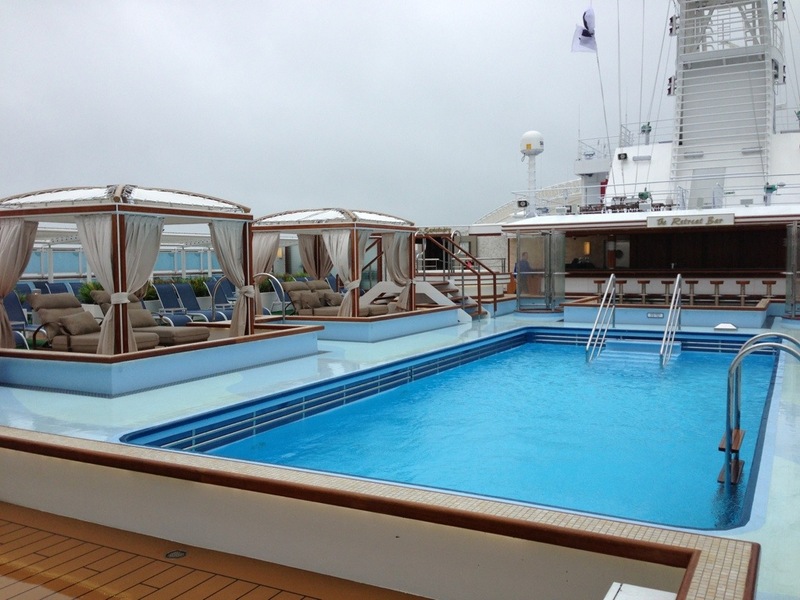 The good old British Weather loves to be ironic and after getting the lift to deck 17 ‘the sun deck’ to be battered with a cross wind while viewing the beautiful Retreat Pool and Cabanas which is an adult only area which gives you the opportunity to rent a private cabana where picnics can be provided. This area will be amazing when the sun deck lives up to its name. 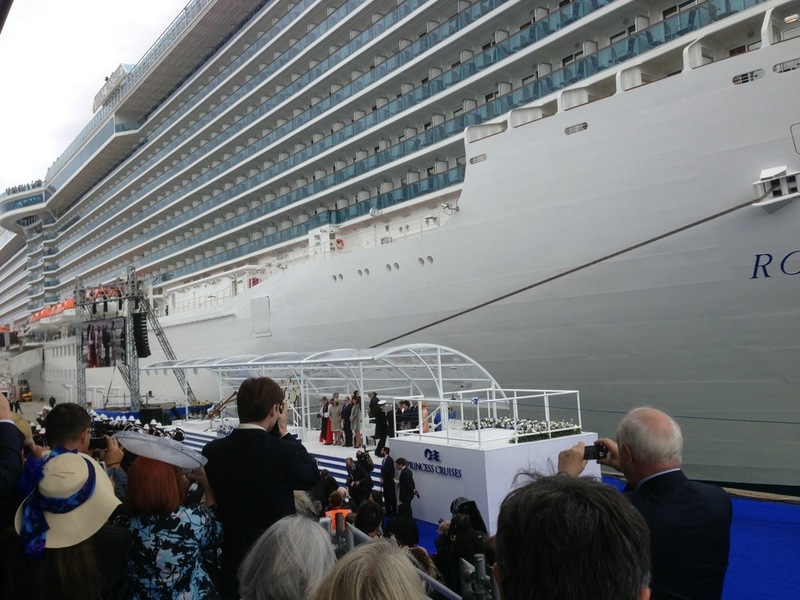 The Atrium is the central hub of Royal Princess and is 50 percent larger than any other atrium on Princess Ships. The Atrium Offers live entertainment, fabulous lounges as well as international cuisine. I have just enjoyed a beautiful ice cream in Gelato. Below is a panoramic picture of this beautiful area. Well I’ve made it to a rather misty and rainy Southampton which is a shame as ships always look more beautiful in the sunshine. I’ve been through a very efficient and friendly check in procedure at Oceans Terminal and its funny how a smile and a welcome lifts the mood in what is the most stressful part of any journey. From check in through to boarding and even in the lift you can feel a genuine welcome from the staff and crew. I walked briefly through the piazza and at a glimpse it looks very traditional and warm. 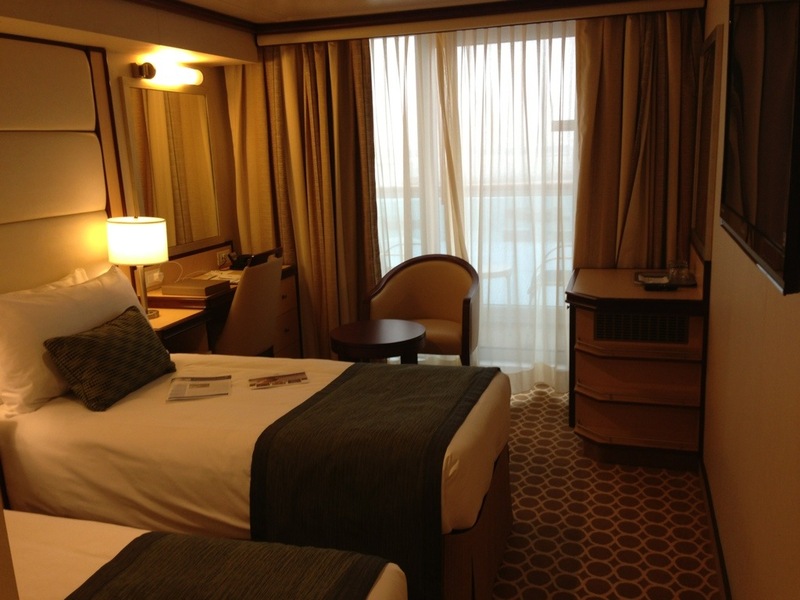 I’ve been allocated a very comfortable stateroom on deck 9 with a private veranda. I forget to describe the basics of staterooms so below I have listed the main facilities in the staterooms (as well as some pictures of course). The first thing that hit me was the storage space was open plan near the the bathroom and gives more space than enclosed units, there also seems to be a lot of under bed storage. The beds look very comfortable and with Egyptian cotton sheets I am sure a good nights sleep will be guaranteed. 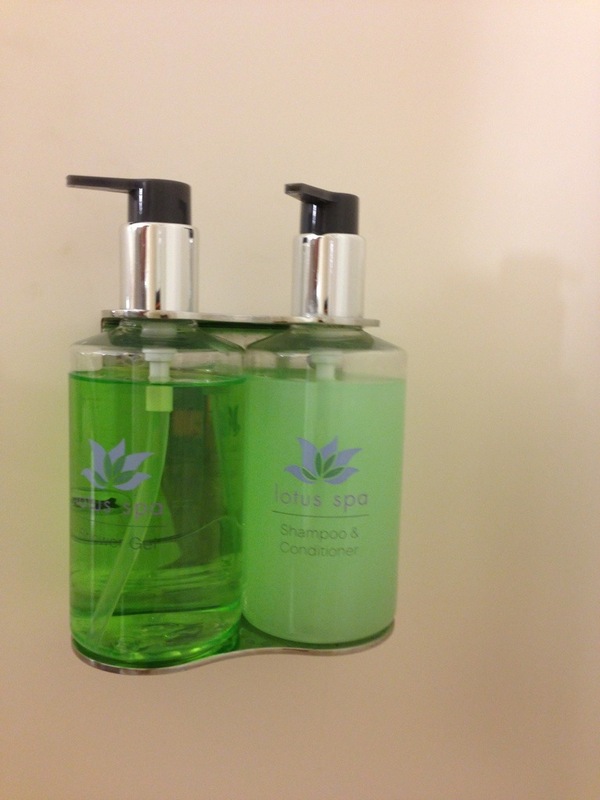 The bathroom is very comfortable with a large mirror, a traditional shower (with shower curtain) and toiletry products from the Lotus Spa (a nice touch). 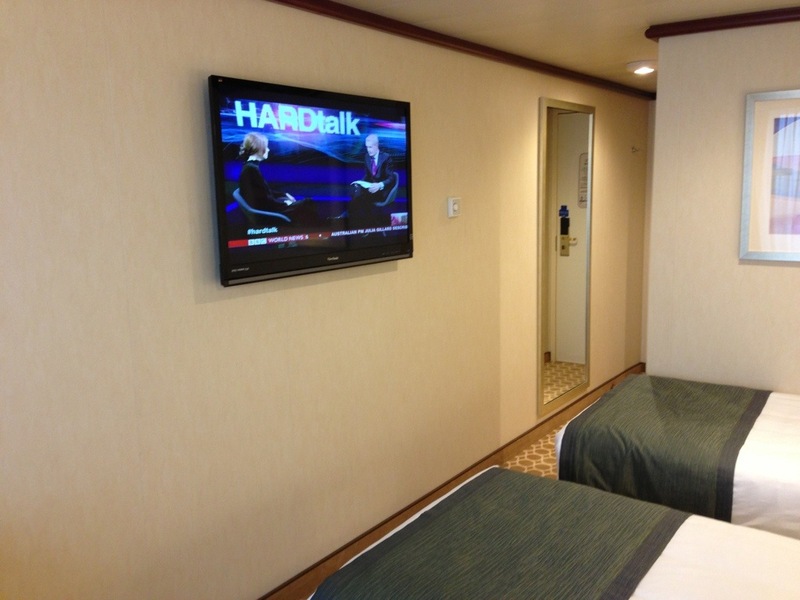 The stateroom has a lovely flat screen tv with your usual international news channels, movies, music and live tv. 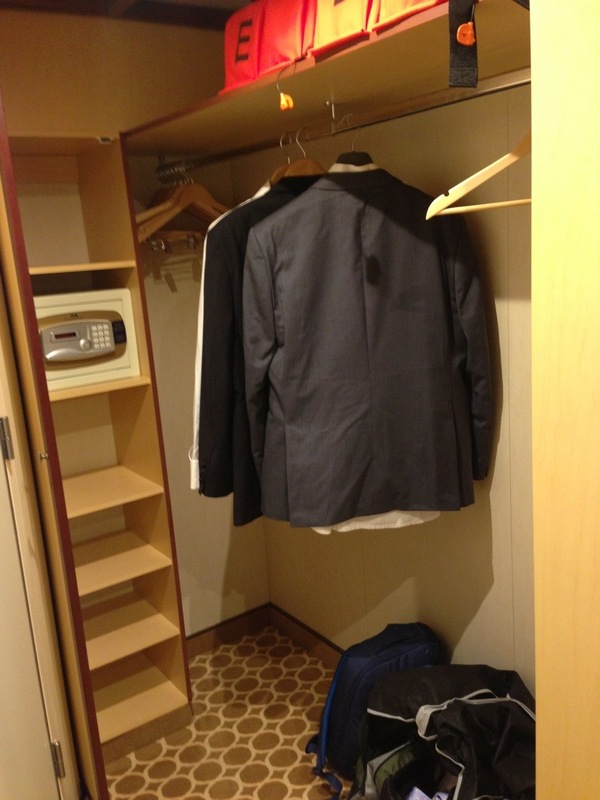 The stateroom also provides essentials such as a mini fridge, a hairdryer, telephone and a full directory with stationary, room service menu and information. 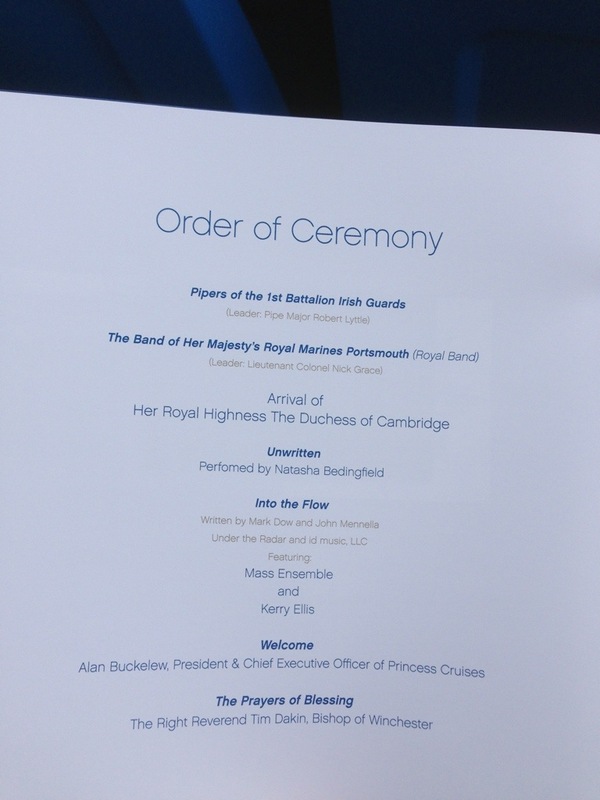 A copy of the PrincessPatter daily guide is an essential part of cruising that new to cruise guests may not know about (this basically tells you what’s on, where and at what time). 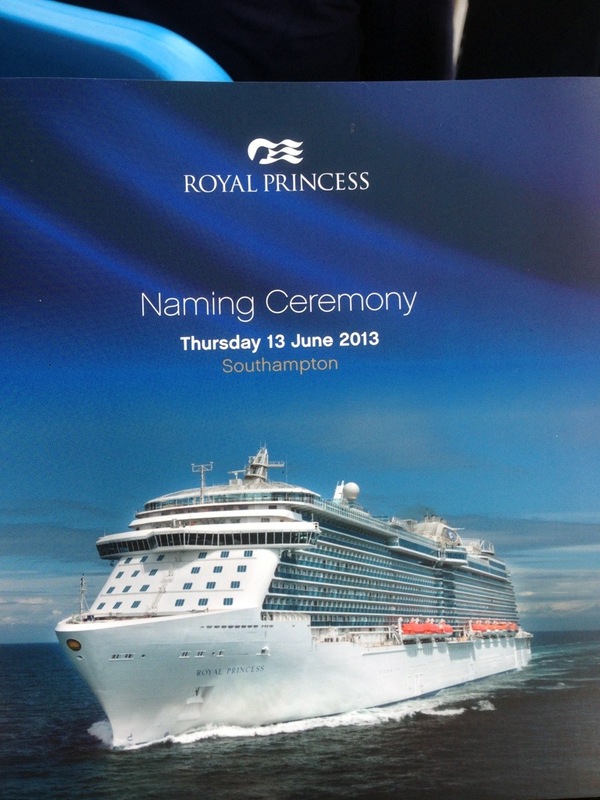 I’m going to start to explore the Royal Princess now and will be adding pictures as a explore. An unusual start for me today as I am at Copenhagen Airport waiting on a flight to Gatwick then a train to Southampton to join the brand new Royal Princess. I am quite excited at the prospect of seeing both of the Royal Princess’s and feel it is quite fitting that the Duchess of Cambridge will become a Godmother and a mother within a few weeks of each other. I am really looking forward seeing the ship as even though Cruise365 have sold Princess Cruises for over 10 years this is actually my first stay on a brand new Princess Ship. Amanda from the office was on Royal Princess on Saturday so if anybody has any specific questions it may be worth calling her as she will be able to help, I will be in the office on Friday and Saturday if you have any queries for me. I will hopefully be boarding Royal Princess at 330pm UK time and will be trying my best to view and take pictures of as many areas that I can. At 141,000 GRT, a length of 1,082 ft and 18 decks to explore I feel that my legs may feel it in the morning. 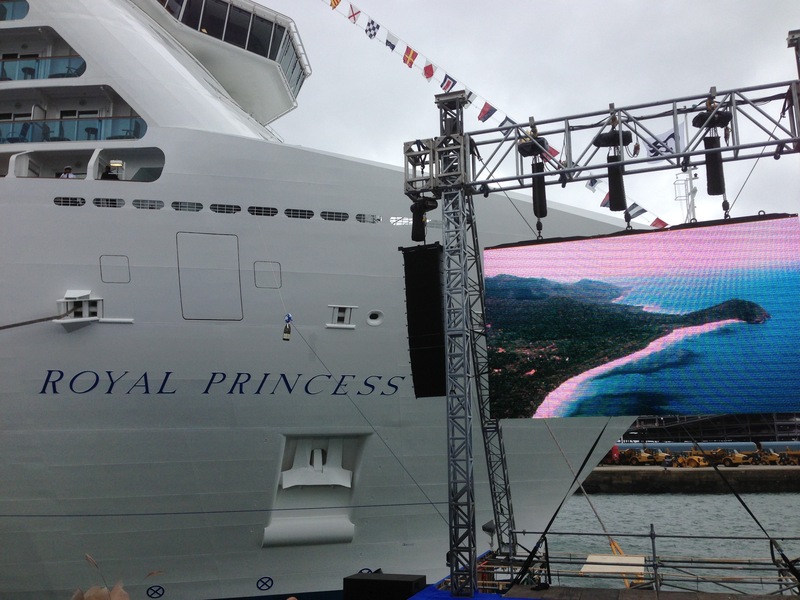 I really do hope that Royal Princess lives up to my own expectations as on paper she looks a fresh ship with enough space to relax, entertain and pamper.